It represents protonation of an alkene by an acid. Two products are of course possible, leading to either a tertiary carbocation as shown in (a), or a primary one (not shown). Either involves two arrows, but how to illustrate this (important) difference in the outcome using the arrows. Most textbooks show (a). The lhs arrow starts at the middle of the bond, and ends at the atom of hydrogen. This unfortunately leads to an ambiguity. It does not define which carbon is involved in forming the new C-H bond. In recognition of this problem an article has recently appeared which attempts to improve model (a) by using what they call bouncing arrows, as in (b). The arrow starts at the mid point of the C=C bond, but then bounces to one end, before heading off to again to end at the H atom. The idea is that the direction of bounce informs which of the two possible bonds will be formed. Leaving aside the (non-trivial) issue of how to persuade e.g. ChemDraw to produce a bouncing arrow, I note that an alternative system has been in use where I teach for many years; (c). This starts by addressing the problem of which bond to form by immediately drawing a dotted line where you want the bond to go. The arrow starts as before, at the mid point of a bond, but this time it ends at the mid-point of the dotted line. If nothing else, Chemdraw has no problem with this notation! Are there any other advantages? Consider (d). The green dots indicate the results of a QTAIM analysis, revealing bond-critical points (BCP) in either the reactants or the products. The first arrow both starts and ends at such a BCP. The second arrow starts at a BCP, and ends at a lone pair (these are not revealed using QTAIM. If instead, ELF synaptic basin centroids were to be used, then all arrows would start or end at such a basin). This therefore gives (c)/(d) some quantum mechanical reality. Another advantage is that one can formulate check-sumrules. By this I mean extra rules that can be used to check you have gotten things correct. Take a look at the red dots, one on the oxygen, another on the bromine. The metaphor is that these can be regarded as hinges, about which the bond swivels, the course of the swivel following that of the trajectory of the arrow. For heterolytic (electron pair) arrow pushing in which none of the centres involved changes its valency, the red dots must be located on alternating atoms. For heterolytic (electron pair) arrow pushing in which a valency change does occur (e.g. formation of a carbene), two red dots must be on adjacent atoms. In general, no more than one arrow either starts, or ends, at a bond. This used to be thought of as a fairly hard rule, but in fact its not difficult to come up with reactions which break it. For example, this one, where as many as three arrows either start or end at a given bond. And, as a challenge, can you break the rule by formulating arrow pushing for the (concerted) reaction between an alkyne and a per-acid (avoiding the anti-aromatic oxirene, the ring opening of which may conflate with the peroxidation). One can interrupt the concerted flow of arrows to form intermediates along the way. One famous example of such interruption is aromatic electrophilic substitution, which can however be persuaded to move all of its arrows more or less synchronously. The metaphor now is one of doors opening and closing, rather than bouncing arrows. There must be thousands of tutors around the world, teaching tens of thousands of students the arcane art of arrow pushing. If anyone has yet another schema for doing so, I would be delighted to hear from them. This entry was posted on Thursday, October 28th, 2010 at 1:26 pm and is filed under Curly arrows, General. You can follow any responses to this entry through the RSS 2.0 feed. You can leave a response, or trackback from your own site. When I was taught the electrophilic addition to alkenes, the mechanism for hydrohalogens was explained in the context of stereochemical and kinetic results – the prevalence of the anti-product and the second order with respect to HX for trivial substrates – thus assuming a trimolecular (or a two-step bimolecular) reaction with a 3-membered cyclic protonated intermediate rather than a discrete carbocation. As for the curvy arrows as a tool for drawing “electronic dance” to describe a mechanism on a paper, from my personal experience I believe a tutor has to make students keep in mind that a solid stick represents a 2-electron bond and that the number of valence eletrons (or the net charge of a system) is conserved. This should prevent a number of weird mechanisms. However, a general chemical thinking has to be the driving force in deriving the “choreo” pattern rather than just attempts to rearrange sticks, dots, arrows, etc. And your blog is a fascinating example on the web of the power of computational chemistry to prove or to question some idea that is used throughout to explain some fenomena. I was taught the same as Bogdan and I always use check-sum rules! I am looking for some textbooks that explains the breakdowns of each formulas because some reactions are base on the wrong mixture of chemicals. Is chemdraw a software of just a method to use for making the curves ? Especially for tutorial purposes, all the (a) – (d) alternatives are seriously deficient stereochemically, as they depict a co-planar olefin, and do not bring out the “π-character” of the attack at all. Furthermore, the intermediate BrH-π hydrogen bonded complex is not considered at all. The direction of the curly arrow from this (unsymmetrically bonded) complex shows the orientational prference. Curly arrow pushing is admittedly very limited. Amongst the aspects it is agnostic about is the three dimensional nature of the system; it is essentially superimposed upon a connection table in 2 dimensions. Some stereochemistry can be added with the usual wedges and hashes, but that in itself is pretty limited. The other aspect that curly arrows do not attempt to capture is the dynamics of the process, the sequence in which things happen. In effect, the assumption is that all the arrows are equal in timing. I would imagine that any attempt to add these further layers would have to be tempered with regard to the clarity of the outcome, and also the knowledge about the detailed structure of the species. This in turn would require high level calculations, which are not always readily to hand. 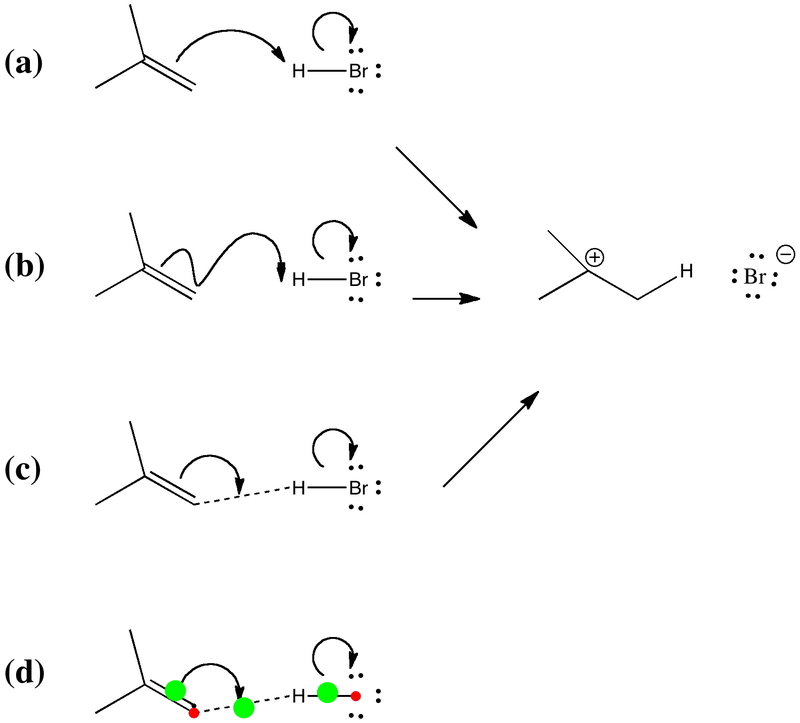 Curly arrows traditionally required schematic knowledge of a reaction mechanism, not the details. Certainly, as you may spot on the pages of this blog, I have tried to address some of these aspects by including IRC animations of the reaction.This injects real 3D coordinates (not just 2D connections) and includes (a first order approximation to) the dynamics of the process. As it happens, I have spent the morning trying to assemble some of these into a reaction library, and this has been mounted on the iTunesU site. It is early days yet with this project, but you are welcome to do the following. 3. Using this device (and a Browser), click on this link. 4. This will enrol you onto the course (library) and produce thumbnail images of each reaction. Press this and the animation will appear. 5. I am also learning how to produce an iBook of the complete collection as well. Do please send me comments/suggestion/complaints! I now recollect that one of the reaction animations I have included on this blog, and also the library I note above is indeed the simple hydration of an alkene using an acid (H3O+ in fact). The IRC for this does indeed bring out several of the points that Paul makes above, including the H-bonded π-complex, the differences in timing of the arrows, the π-character of the attack. What it does not do is include a methyl substituent on the alkene, to show how in reality the outcome producing a secondary carbocation is favoured over a primary one. This would be easily done, and I shall presently report back on this. Actually, it does convince me that IRCs may well be a better next step to improve the curly arrow notation we have been using for almost 100 years now. Postscript: This site by Nick Greeves is called ChemTube3D, and there you can see curly arrows in 3D, rendered using not so much Chemdraw as Jmol. There are kind of a half-way house between the conventional flat curly arrows, and the full QM-IRC. Secrets of a university tutor: (curly) arrow pushing is licensed by Henry Rzepa under a Creative Commons Attribution-Noncommercial-Share Alike 3.0 United States License.